Turkish lira's rate, as we expected earlier, is weakening day by day. In the past month we have made analysis on this currency pair, and recommended buying the US dollar and sell the Turkish lira. Our recommendation turned out to be true, the goal was achieved, and we have earned on the movement of more than 800 points. Now the situation is similar. After the US presidential elections, the US dollar has remained as strong as it was. Many forex traders continue to buy American currency. Forex market investors also prefer to keep their investment in dollar, as its improving position in the Forex against many currencies. 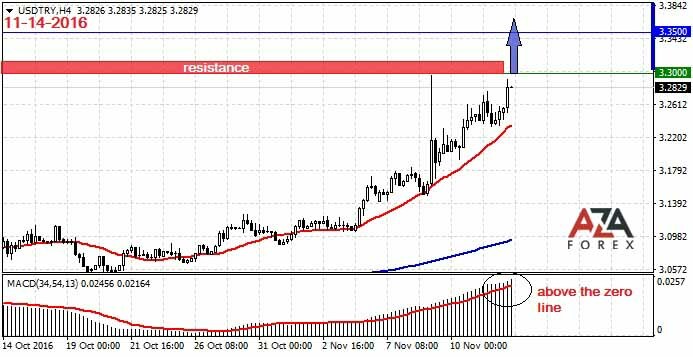 Now on the chart of the currency pair, we see that the price went up again to its historical maximum. It always gives traders a good opportunity to ride on the momentum after breaking another record of trading instrument. A good move over 500 points is expected, given the scale of the entire schedule of the growing trend. Therefore, if the price will go up further, we join the bulls and open a long position.